There's a big day coming up -- and this is something you can share with friends, family, and co-workers. This Friday is Veterans Day. It's held on November 11th (or observed on the nearest weekday, since it is a Federal holiday and all), in honor of the signing of the Armistice that officially ended World War I. It was signed on the eleventh hour of the eleventh day of the eleventh month ... of 1918. 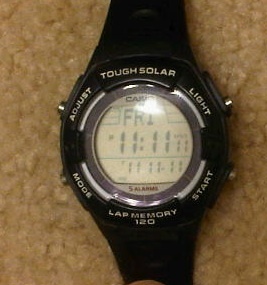 My Casio LW-200H, which I'm very happy with for running and workouts. The delay on my camera stinks; it took multiple shots and resets of the watch to time it correctly. You may now return to your usual level of Geekery.